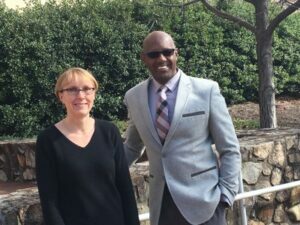 Jennifer Flythe, MD, MPH, and Terence Oliver collaborated. 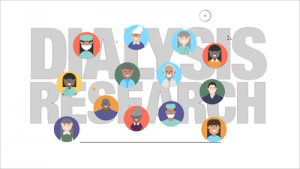 A recent dialysis research study shows many aspects of research can be improved to encourage broader patient participation and better align research and clinical processes in clinics. A product of the study is a new video tool that features actual participants in animation. Research can create better futures for people on dialysis, those who care for them in clinics and those who care for them at home. A new study led by UNC Kidney Center’s Dr. Jennifer Flythe, recently published in the American Journal of Kidney Diseases, shows many aspects of research can be improved to encourage broader patient participation and better align research and clinical processes in dialysis clinics. Focus group participants agreed, more education about the research process is needed, and why it’s important, for both patients and dialysis clinic personnel. Participants from Flythe’s dialysis research study are introduced through animation. A product of the study is a new video tool Flythe hopes will generate awareness by sparking new conversations about dialysis research in the clinical setting. Based on input from over 75 stakeholders that included more than 30 patients and care partners, the video uses realistic animation to answer such questions as “What is research?”, “How do researchers keep study participants safe?” and “Why might I want to participate in research?” Flythe collaborated with award-winning motion graphics producer Terence Oliver, an associate professor in the UNC School of Media and Journalism to produce the video. The video stars Nate, a real dialysis nurse, and Jason, an actual dialysis patient. Using a combination of interviews and animation, the storyline recognizes how research doesn’t always lead to clear answers, nor does it necessarily have a direct benefit for those participating. Viewers also learn that even though some studies don’t lead to clear answers, they can still lead to new ideas, and new ideas can lead to more research that eventually benefits patients. The video emphasizes that research is a team effort, and that years of research go into developing new treatments that thousands of patients, doctors and clinic staff make possible by participating in the studies that test them. It even suggests questions that potential research participants and facilitators may want to ask researchers. The video can be found here: http://go.unc.edu/DialysisResearchVideo. Oliver says computer animation is an effective way to communicate dynamic ideas and processes related to research discoveries, that can reduce the abstraction associated with complex ideas. Working with a good storyteller can also maximize the awareness and potential use of research findings. Funded by a Patient Centered Outcomes Research Institute (PCORI) Engagement Award, the video is a free, downloadable resource that explains how scientists and doctors use research to answer questions and get information to improve the lives of patients. The video may be used to educate clinical staff and patients and generate enthusiasm about research. While many of the video examples are dialysis-specific, its messages transcend nephrology and are relevant for diverse populations.